Latvia, Lithuania and Estonia worried about the same thing happening to them. Russian forces massing on the border of Ukraine. No, this is not the opening scene of some pre-World-War-2 movie; it’s history from the past couple of weeks. But during the Cold War, Russia had control of all of these under the umbrella of the Soviet Union. In the 1980s, President Ronald Reagan set out to defeat – not just contain, as his predecessors has done, but defeat – the Soviet Union. He succeeded. His detractors said, and continue to say, that he got lucky; that the Soviet Union was going to collapse under its own weight anyway, and it just coincidentally happened on his watch. But Reagan was the first President to actively try to bring it down. That it happened right after this attempt is a cause & effect that is extremely rare in geopolitical affairs. And those he liberated – from places already mentioned as well as Poland and other former eastern Bloc nations – certainly give him that credit. And he did it without causing a nuclear World War 3, which those detractors predicted. The problem with pretending everything is OK with Russian relations is that Russian politicians just don’t like to be criticized, especially by their own people. And they’ll find anyone to blame it on. Prime Minister Vladimir Putin strongly criticized U.S. Secretary of State Hillary Rodham Clinton on Thursday, accusing her of encouraging and funding Russians protesting election fraud, and warned of a wider Russian crackdown on dissent. By describing Russia’s parliamentary election as rigged, Putin said Clinton "gave a signal" to his opponents. "They heard this signal and with the support of the U.S. State Department began their active work," Putin said in televised remarks. He said the United States is spending "hundreds of millions" of dollars to influence Russian politics with the aim of weakening a rival nuclear power. Putin’s tough words show the deep cracks in U.S.-Russian ties despite President Barack Obama’s efforts to "reset" relations with the Kremlin. Ahead of the election, President Dmitry Medvedev threatened to deploy missiles to target the U.S. missile shield in Europe if Washington failed to assuage Moscow’s concerns about its plans. Clinton has repeatedly criticized Sunday’s parliamentary vote in Russia, saying "Russian voters deserve a full investigation of electoral fraud and manipulation." Tell the truth to the Russians, get blamed for everything. Obama naïvely blamed Bush for…well, just about everything. But the fact is, Russian relations have very little to do with being nice to them or presenting toy reset buttons. Betsy Newmark notes the collective disinterest in new documents that give us a much better look into the waning day of the former Soviet Union. This is amazing stuff: Claire Berlinski reports on documents smuggled out of Russia about the last years of the Cold War. These are documents from Gorbachev’s own files and are an amazing treasure trove of notes from his meetings with foreign dignitaries and from the Central Committee of the Communist Party. Simply fascinating stuff. But no western publisher seems to be interested in publishing any of this. Why wouldn’t western researchers and publishers be interested in documents containing such tidbits as Gorbachev’s response to the Chinese killing dissidents in Tiananmen Square? Maybe they don’t like the real story of how he just shrugged it off. Or his laughter at the news of the Soviets shooting down a Korean jetliner. The press and the Left in this country were apologists for the Soviet Union, very nearly lionizing Gorbachev. So it’s no wonder that this is not getting more notice in the network news. Again, it’s all about the narrative (and not wanting to be shown to be horribly wrong about them). And not only the US press but the European press as well which, again, were all too ready to seek the USSR’s approval rather than take the hard positions on what was right. Betsy has more, and Clair Berlinski has lots more. And you gotta’ wonder if “USSR” was replaced by “Nazis”, whether this would be equally as ignored. Treating your enemies better than your allies doesn’t seem to be working, for either our enemies or our allies. How’s that working out for President Obama? Charles Krauthammer takes a look back at the past nine months and ticks off this administration’s biggest foreign policy initiatives. What’s come from Obama holding his tongue while Iranian demonstrators were being shot and from his recognizing the legitimacy of a thug regime illegitimately returned to power in a fraudulent election? Iran cracks down even more mercilessly on the opposition and races ahead with its nuclear program. What’s come from Secretary of State Hillary Clinton taking human rights off the table on a visit to China and from Obama’s shameful refusal to see the Dalai Lama (a postponement, we are told)? China hasn’t moved an inch on North Korea, Iran or human rights. Indeed, it’s pushing with Russia to dethrone the dollar as the world’s reserve currency. What’s come from the new-respect-for-Muslims Cairo speech and the unprecedented pressure on Israel for a total settlement freeze? "The settlement push backfired," reports The Post, and Arab-Israeli peace prospects have "arguably regressed." And what’s come from Obama’s single most dramatic foreign policy stroke — the sudden abrogation of missile defense arrangements with Poland and the Czech Republic that Russia had virulently opposed? For the East Europeans it was a crushing blow, a gratuitous restoration of Russian influence over a region that thought it had regained independence under American protection. But maybe not gratuitous. Surely we got something in return for selling out our friends. Some brilliant secret trade-off to get strong Russian support for stopping Iran from going nuclear before it’s too late? Just wait and see, said administration officials, who then gleefully played up an oblique statement by President Dmitry Medvedev a week later as vindication of the missile defense betrayal. "Russia Not Budging on Iran Sanctions; Clinton Unable to Sway Counterpart." Such was The Post headline’s succinct summary of the debacle. Note how thoroughly Clinton was rebuffed. Russian Foreign Minister Sergei Lavrov declared that "threats, sanctions and threats of pressure" are "counterproductive." Note: It’s not just sanctions that are worse than useless, but even the threat of mere pressure. There’s more; read the whole thing(tm). Now granted, nine months is not time enough to make great strides. Heck, it’s barely enough time to win a "peace" prize. But if the world has a collective thrill up its leg over the election of He Who Is Not Bush, it’s having a difficult time showing it. As I noted 3 years ago, the facade is just that; a false front. Goodwill was not squandered because little of it was there in the first place. The world is just as difficult to work with now as it has ever been, especially for those European leftists who keep trying to remake American in their image, those radical Islamists who hatched a massive terrorist attack plan while we had a Democrat in the White House, and a Russian government deeply paranoid of America, no matter who is in power. Fine oratory, promises, and a medal given because of them, will not change the world. There are too many enemies out there that will be placated only by a credible threat of force. The more credible the threat, the less likely it is that it need be used. So how’s all that "capitulate to their demands and get them on our side" plan going? Not so well, apparently. The minister, Sergey V. Lavrov, said after meeting with Secretary of State Hillary Rodham Clinton here that diplomacy should be given a chance to work, particularly after a meeting in Geneva this month in which the Iranian government said it would allow United Nations inspectors to visit its clandestine nuclear enrichment site near the holy city of Qum. Mr. Lavrov’s resistance was striking given that, just three weeks before, President Dmitri A. Medvedev said that “in some cases, sanctions are inevitable.” American officials had hailed that statement as a sign that Russia was finally coming around to the Obama administration’s view that Iran is best handled with diplomacy backed by a credible threat of sanctions. It also came after the Obama administration announced that it would retool a European missile defense system fiercely opposed by Russia. That move was thought to have paid dividends for the White House when Mr. Medvedev appeared to throw his support behind Mr. Obama on Iran, though American officials say the Russian president was also likely to have been reacting to the disclosure of the secret nuclear site near Qum. See, if Iran gets a nuke, it’s highly unlikely that Russia will ever be a target, given how close these two have worked in the past. So Obama, instead of proving his Jedi diplomacy skills, got played instead. Apparently, Medvedev is immune to those Jedi mind tricks. Even Obama’s supporter in the punditocracy are complaining about this administration’s efforts. And, no, Obama hasn’t reset the American relationship with Russia. He was taken for a ride. Maybe his vanity won’t let him admit it. But, believe me, the Russians know they have taken him (and us) for a big ride, indeed. After Obama agreed to cancel the missile defense program for Poland and the Czech Republic, the president got Moscow to give him an inch. Maybe, they said, we’d have to move on tougher measures against Iran if Tehran doesn’t satisfy us on its nukes. “Hallelujah!” said the president and his entourage. Just before Hillary arrived in Moscow, she warned that America was impatient. With whom? With the Iranians, of course. But her impatience with Tehran will be useless unless we get impatient with Russia. Of course, if you don’t ask, you don’t get. In fact, with the Russians, if you don’t demand and threaten a little, you get zero. As history has shown us. No, not everybody can be trusted, reasoned with or impressed upon. Sometimes you just gotta’ be the cowboy. They may complain about it and say they don’t like us, but being liked by the rest of the world shouldn’t really be a main goal of US diplomacy. That’s what Nobel "Peace" Prizes are for. In response to my post on the blog "Stones Cry Out" about the delusions of negotiating with Iran, commenter Dan Trabue responded with why negotiation and pressure should be able to convince Iran not to go nuclear, and if it didn’t then it was a failing on our part. If we go to war, it is an admission of failure on our part "that we’ve failed to outsmart this particular unreasonable leader." Supposedly, George W. Bush squandered all the goodwill we got from the world as a result of the 9/11 attacks. 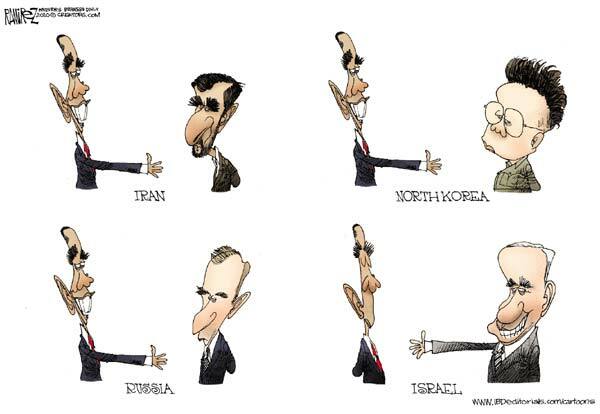 Enemies became friends, the uncooperative became helpful, and all was right with the world, until Bush screwed it up. What is forgotten in all of this is that those that opposed us before 9/11 opposed us after it too, with a brief fair-weather friendship in between. Nothing was actually squandered because nothing was actually gained, other than a brief facade that apparently many fell for. Of course, when places like France started electing people more aligned to the Right, suddenly actual cooperation with the US was back, but this time the Left ignored it. The narrative was already in place. The Iraq war was "unilateral", except for the dozens of other countries helping out. The world hates us now, except that those countries pretty much hated us before, too. Going after terrorists, their enablers, and, oh yeah, a Ba’athist that had continually broken the terms of his cease-fire despite dozens of harshly-worded UN resolutions; that pushed the world away. News flash; they were never really close enough to us to be pushed. It was all an optical illusion. But now we have a President who says he wants to mend our fences with the world, and get them to like us again. He’s made some speeches that got huge crowds, which is all very nice. But what is he doing to bring people back to loving the US? Polish President Lech Kaczynski said he was concerned that Obama’s new strategy leaves Poland in a dangerous "gray zone" between Western Europe and the old Soviet sphere. "No Radar. Russia won," the largest Czech daily, Mlada Fronta Dnes, declared in a front-page headline. Say what you want about Bush, but he went after those with designs on killing us. Obama is supposedly mending fences by ticking off our allies, in order to not offend a nuclear Russia. Why should Russia be offended at a missile shield in eastern Europe if they really have no designs on it? How is this, as they claim, a security threat or political provocation? How is that an affront, especially when the International Atomic Energy Agency believes that Iran has (not "will have" but "has") the knowledge to make a nuclear bomb, which is arguably the most significant part of the process. But never mind allies who may need protection from a rogue state, we need to make sure Russia doesn’t get its feelings hurt. The replacement? Because after all, 10 years is certainly not enough time for Iran to come up with a delivery system for a nuke, right? Right? And this all begs a couple of questions; if Russia doesn’t like the system that was to be implemented, who’s to say that they’ll like the new one, and will Obama scrap this new idea if the Russians don’t like it? Way to mend those fences. Is This "Making the World Like Us Again"? The blog "Stop the ACLU" has a run-down of just the recent cases of countries doing things in a manner that doesn’t exactly say they like us again. Cuba and Venezuela opening up their airfields to Russian bombers. Ecuador (Ecuador!) expelling US diplomats for the second time this month. Iran continues its nuclear ambitions (and blames economic isolation for their pushback). North Korea threatens to test a ballistic that some believe could hit the US west coast. Hillary Clinton did, however, use the strongest possible terms to denounce that missile test, saying that such a launch would be "very unhelpful".